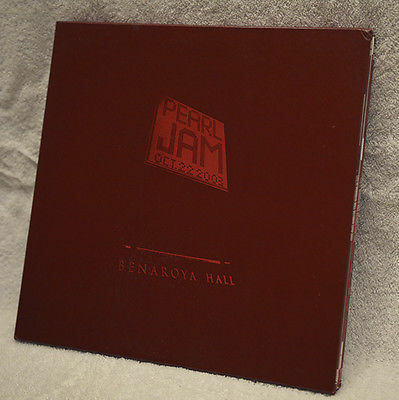 You are bidding on a rare, opened but played just once, collector’s edition red vinyl box set of Pearl Jam Live at Benaroya Hall in Seattle, WA from 2003, poster included. This four record box set is hand numbered # 1113 of 2000 produced. The manufacturer dinged the corner of the outer box when packing it (a common occurrence with this box set), and the four inner sleeves were dinged from the same incident (see photo), but there is no damage to the records or poster inside. Recorded live on October 22, 2003 for the benefit of Youthcare. Limited to 2000 numbered copies worldwide. The box set includes a poster and is pressed on Red 180 gramvinyl. This box set will shipfully insured, with tracking and delivery conformation with a signature required. Buyer will pay shipping costs. Shipping within the United States only. Sale is final.No Returns.